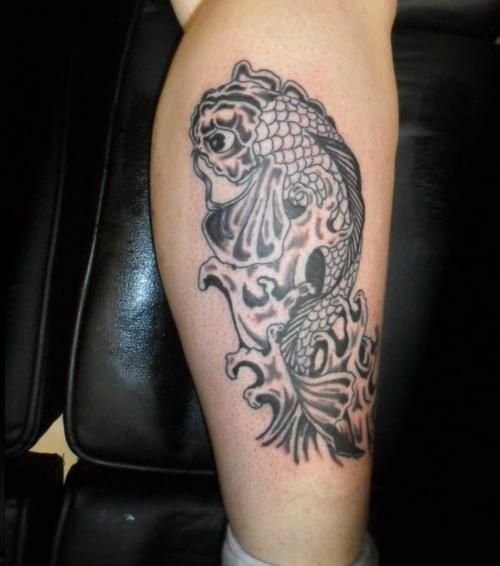 This koi tattoo is done in black and grey on the calf of his leg. The carp’s features have an unconventional look. This koi tattoo has an interesting look because most people fill the scales of the fish with bright colors and add flowers. This guy kept it in all black with grey shading and created a smoky look for the surrounding waves. The head and fins also have a more sculpted look with shading. Koi tattoos have lucky connotations in Japanese culture but this black and grey style makes it look like it has a darker meaning. A carp is a good shape for areas like the calf of the leg because the tail can curve down and thin out to fit the width of the ankle and the head can fill in the entire calf muscle area.